At its Atmosphere Live event today, Google shared some important Google Cloud Platform news. The first comes in the form of a price cut for Google Compute Engine and the second is a milestone for Google Drive. During the company’s Cloud Platform Live in March, executives declared that cloud computing should be priced in accordance with Moore’s Law. Google says it “set a new standard for economics in the public cloud” when it slashed prices for both compute and storage, causing Amazon to quickly react and do the same thing for its AWS platform. 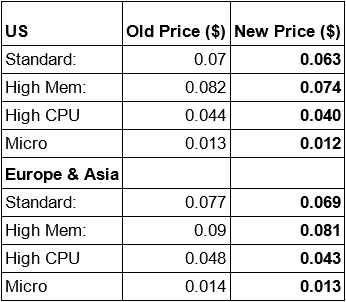 Holzle argues that Google can lower prices once again as a result of a decrease in the underlying cost of hardware. Furthermore, the company sees major efficiency gains that come from running your own service and managing your own data centers. Following Holzle, Sundar Pichai, Google SVP of Android, Chrome and Apps, took take the stage and revealed that Google Drive now has more than 240 million active users. This is up from 190 million active users in June, meaning the company has managed to add 50 million new users in just one quarter. With the Google Drive for Education debut yesterday, it won’t be long before the 300 million milestone is reached. Google also made a point to highlight the word “active” – clearly a jab at competing services like Dropbox. Back in May 2014, the startup said it had passed 300 million users, but didn’t say how many of those actually actively used the service. In both cases, Google is flexing the muscles of scale. When it comes to the cloud, few startups can compete with the likes of tech giants like Google, Amazon, and Microsoft.